but those virtues are, at times, accompanied by a host of other cyber-annoyances, including spam emails, viruses, slow downloading, and advertising popups, among (far too many) others. Buy ANTHROlogy, and you can enjoy the magazine anywhere and any time theres light to read by. This means you wont need to worry about how much power is left in your machines battery, or where the closest wall socket is. Heck, you can even read it in the bathtubtry that with your average laptop, if you dare! And even better, the book is absolutely guaranteed to not inflict the kind of eyestrain that comes with reading text on a comparatively low-resolution computer display. 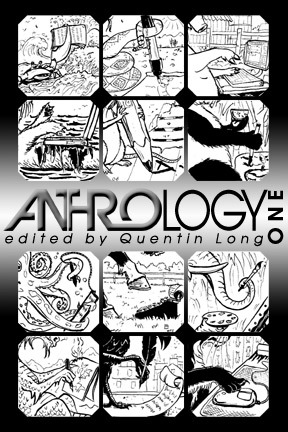 ANTHROlogy is an annual publication. Each year, well assemble pretty much everything that appeared in the magazines latest six issues; wrap it up in an specially-commissioned original cover; and make it available to you, our loyal readers, through ANTHRO Press. At this point we cant say how large ANTHROlogy Two will be, nor yet how much itll cost. However, we can say that it will contain the lions share of everything that appeared in Anthro #s 7 through 12.